Recently Apple introduced a series of iBook textbooks designed for the iPad. At the same time they released the software for Mac OS that allows you to make your own. These iBook textbooks include smart layouts, text, interactive pictures, videos, glossaries, highlighting and note-taking programs. These are books that move, interact, and come alive. And, as is the case with the exemplary Life on Earth by E.O. Wilson, they can be quite beautiful. Like many of us, I have been making “textbooks” for years - first by stapling together packets of Xeroxed handouts, but later by making class websites and such. So I was very excited about the new software and spent my weekend making a textbook to introduce into my eighth grade class. Lesson One – Have a backup plan: Being a large file, my iBook took a long time to download. And many of the students needed to run an update just to open it. These are the normal birth pangs of any new technology in the classroom. And luckily I had a short writing assignment for the wait. But twenty minutes into class only half of my students had completed the download. Lesson Two – Be willing to change: With only half of the class possessing my iBook, I divide the class into pairs. Each pair shared one textbook and together they read a chapter and took notes. It wasn’t the original plan, but I was happy that they were able to work together, discuss, and interact. Lesson Three – An iBook is a book: The iBook is a wonderfully reinvented textbook, but it is still just a book. 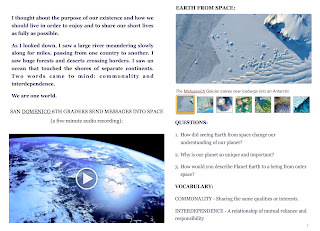 After the class had read their chapters, watched their embedded videos, interacted with images, highlighted and taken notes, we where in the same place as every teacher and every class: What do we do with the information we have read? How do we make sense out of it? How do we integrate it toward some conclusion that is relevant to us and our world?